This fish seems to be based off of a koi, specifically the ochiba shigure variant which translates into "Autumn leaves on water". Their spots are less red and are instead orange/gold and their primary colour is greyer than what you may typically think of when you hear koi. 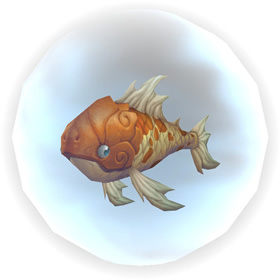 This pet is excellent to use against Stitches Jr. Jr. for the WQ in Dalaran, with Cleansing Rain and Pump. i want to use him and blue carp in a team with blue carps magic attacks. can anyone recommend a good third? I don't think I got mine from there, I got mine from the beginning panda area when you get there on the dropship thing. It's a bit after that and I think a quest from a friendly monkey but you don't have to be friendly with them because it's automatically neutral. 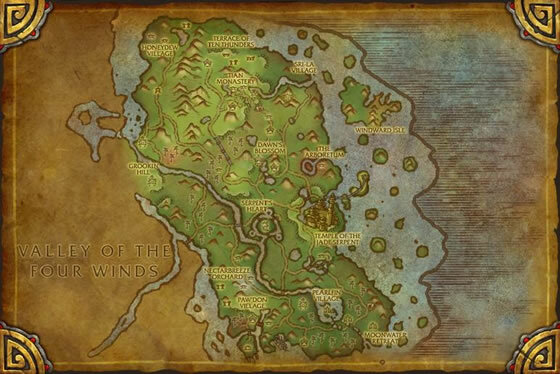 Where does the quest start for horde? **update** for those horde confused by lack of correct information, The quest for this pet on HORDE side Quest is called "Whats in a Name Name?" Given by NPC Chief Kah Kah. Quest starts in Grookin hill, so you must be friendly with the monkey villages and have done the prior quests. Many believe (incorrectly) that goldfish have no memories. Trainers who have worked with them know this is clearly not the case and have the bruises to prove it.